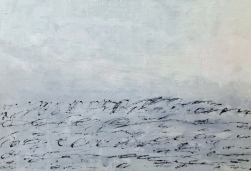 Clara Berta’s acrylic and mixed-media artworks blend texture and color to create harmony, mystery and depth on the painted surface. Many of the resulting shapes are irregular, vague, incomplete, overlapped, and transformed, free of traditional associations such as postmodern Abstract Expressionism or Conceptualism. Her richly layered works have been exhibited across the United States in galleries such as Artspace Warehouse Los Angeles and collected internationally. 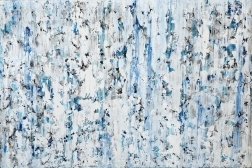 This one-of-a-kind original blue, white and gray painting is 48 inch tall by 72 inch wide. It is stretched, wired and ready to hang. The sides of the painting are painted white. It does not require framing. It is signed and titled by the artist on the back. Free local Los Angeles area delivery. Affordable Continental US and worldwide shipping. A certificate of authenticity is included.